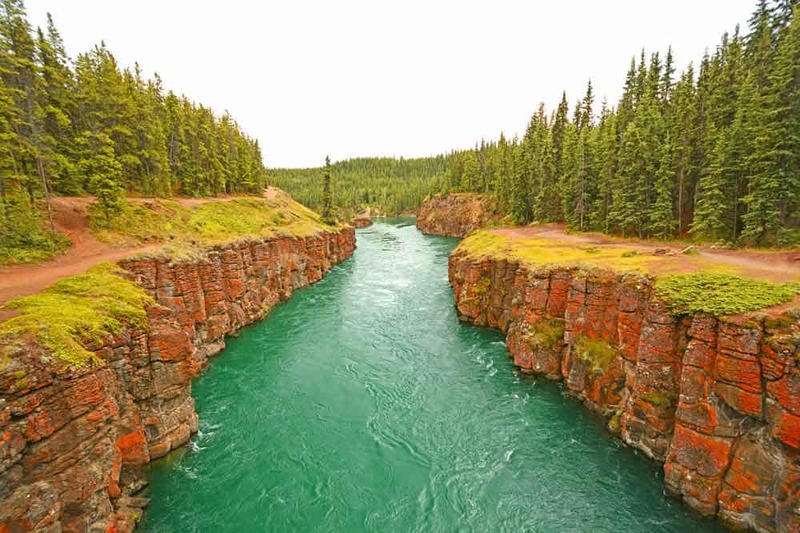 The Alaska Highway – also known as the Alcan – is a dream destination for any road tripper. 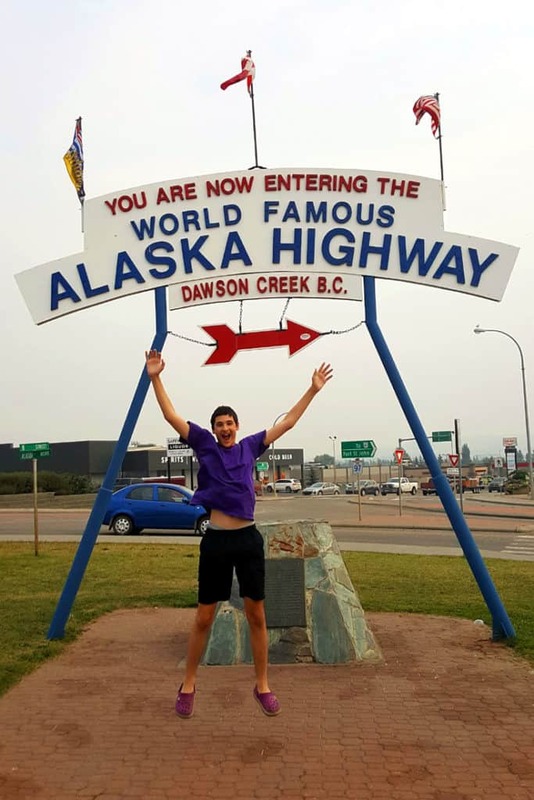 This legendary 1,390 miles long road connects the Canadian town of Dawson Creek, British Columbia with Delta Junction in Alaska. We love road trips and – fingers crossed – we hope to be driving this awesome road in 2017. 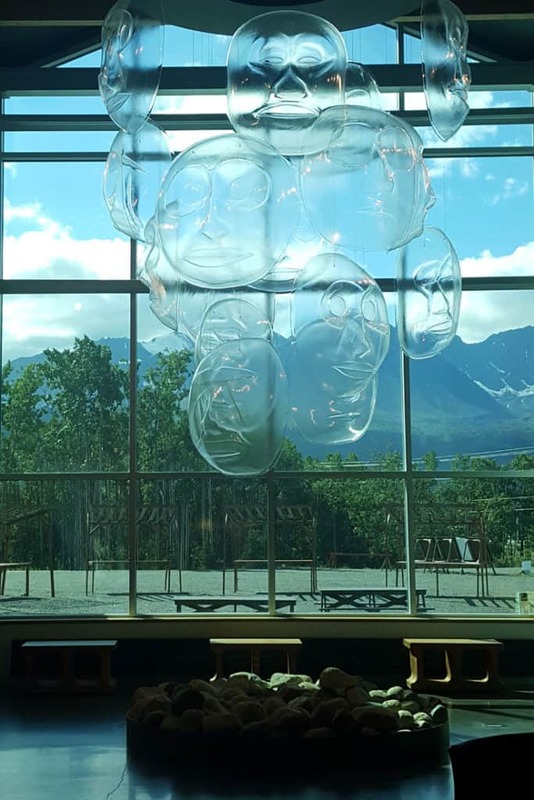 In this post, I’m sharing my list of things to do and see along the Alaska Highway. We did it! We drove from Los Angeles to Alaska, toured the state for three weeks and then drove back. I’m here to update this post with fresh content and change the dates too. I decided to go over it and add more about each spot I had here in my original list, sharing photos from our own visit as well as our impressions. It’s time to change the cover image too. We actually had a GoPro doing a timelapse of the entire drive so I have literally tens of thousands of photos of the Alaska Highway to choose from… But I went with this one – the view from the Soldier’s Point trail in Kluane National Park. This is where the US army finished building the road in the 1940’s – the very last bit that connected Alaska with the Lower 48. So, this is how this post is going to work. I won’t be deleting any of the information I put into it before our trip (back in 2016). I’ll add in italics my post-trip impressions so you can have both perspectives in the same post. From now on italics means a new addition to the post, so let’s dive right in! 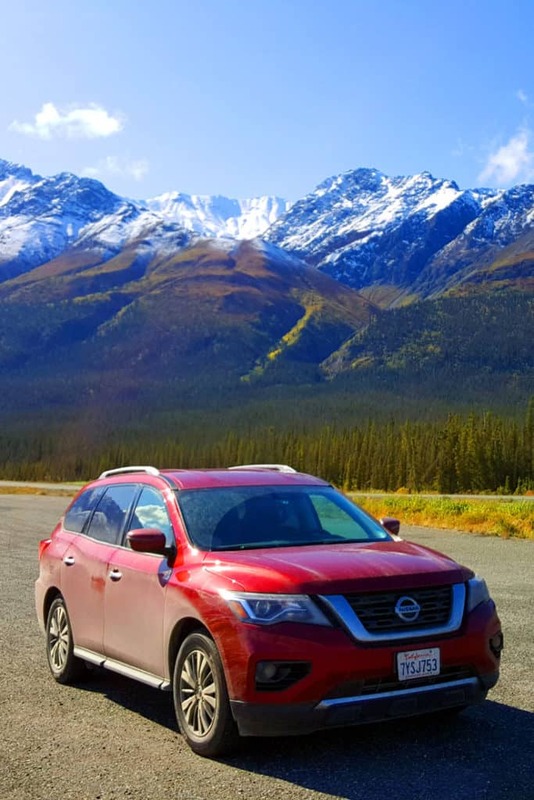 Another Update: I added a post in this blog about driving to Alaska. It’s a mammoth post which covers a lot more than just what to see on the way. Do check it out if this is something you’re thinking of doing. You can’t really talk about a road trip from the Lower 48 to Alaska without mentioning this book. 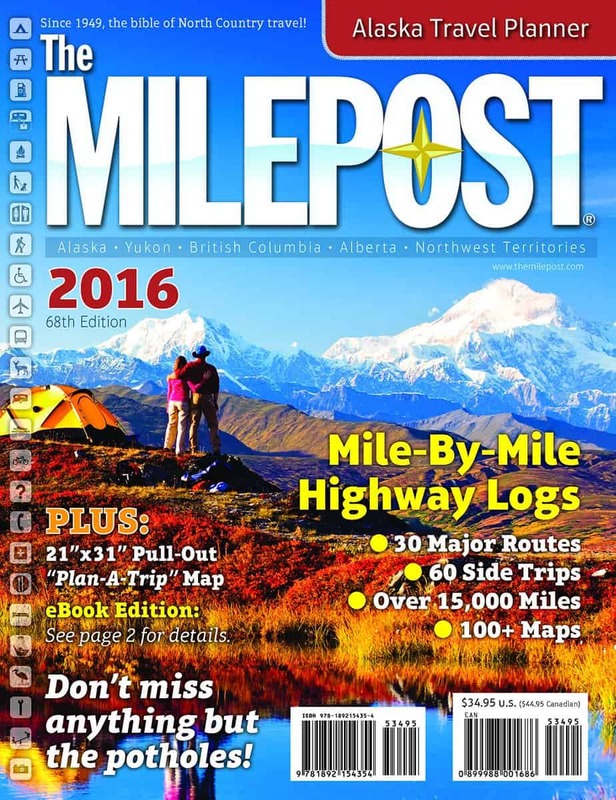 Yes, I already bought our copy of the Milepost! The Milepost is essentially a road atlas. 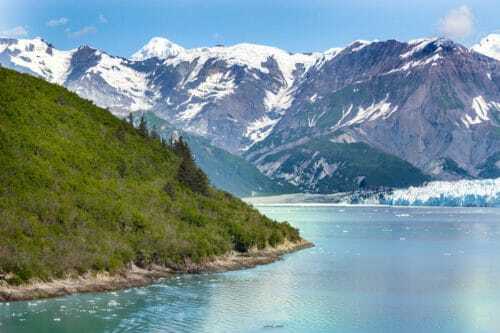 It offers a detailed point-by-point description of the Alaska Highway and other roads in Alaska and the the way to Alaska. Frankly, I am amazed that people still use a printed book as a road atlas in 2016. Yes, you can get the ebook edition but I once you take a look at the pages, it’s clear that this kind of small print needs to be read from the book. There is no convenient way in which you can condense the amount of information on each and every page into a small screen. I’m going to start working on a possible itinerary soon. For now, I’m mapping out the places where we’ll want to stop for a while and do some sightseeing. 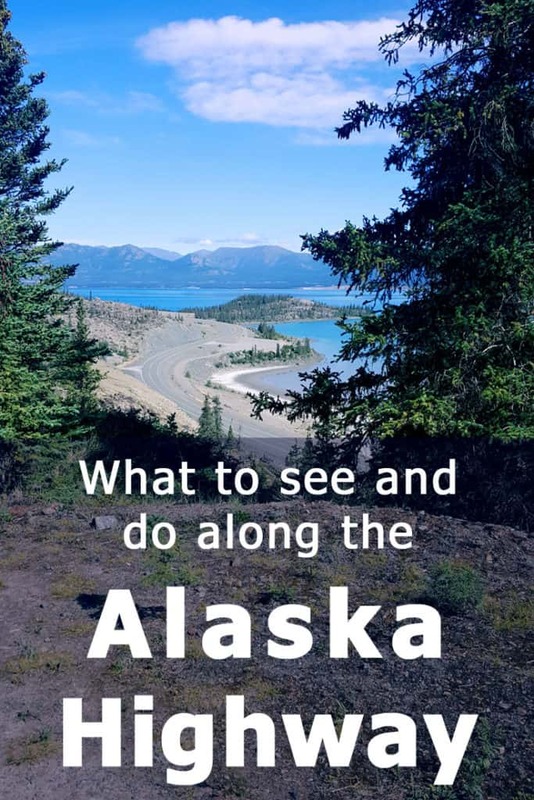 My previous blog post was about our Alaska Bucket List and so this is a bit of our “Alaska Highway Bucket List”. You can view the locations on the Google map I prepared. It’s embedded into this post towards the end. This list covers the Alaskan Highway, from Dawson Creek in the south (a very relative use of the word south here! ), all the way to Delta Junction in Alaska. So, did we end up using the Milepost? We sure did! We had quite a battered copy in the car by the end of the trip. Granted, we didn’t rely on its mile-by-mile description all the time but it certainly came in handy when we were in the middle of nowhere, wondering when the next bathroom stop might be. At least twice we used it to find accommodation. Driving through the Alcan in the late afternoon or evening, it was good to know how many miles we had before we get to the next point where we might be able to spend the night. Mind you, it’s still not a booking.com app. By that I mean, you can’t exactly use it to book accommodation in advance, or even read the full description of what’s available, let alone reviews. And I like reading reviews. Still, knowing there are people there who may be able to offer you a bed for the night does help. This small British Columbia town of 11,500 inhabitants prides itself on being the place where the Alcan begins. You can have your photo taken next to the Mile Zero post in town. Dawson Creek is an overall pleasant town with hiking trails, parks, murals and even a farmers market. 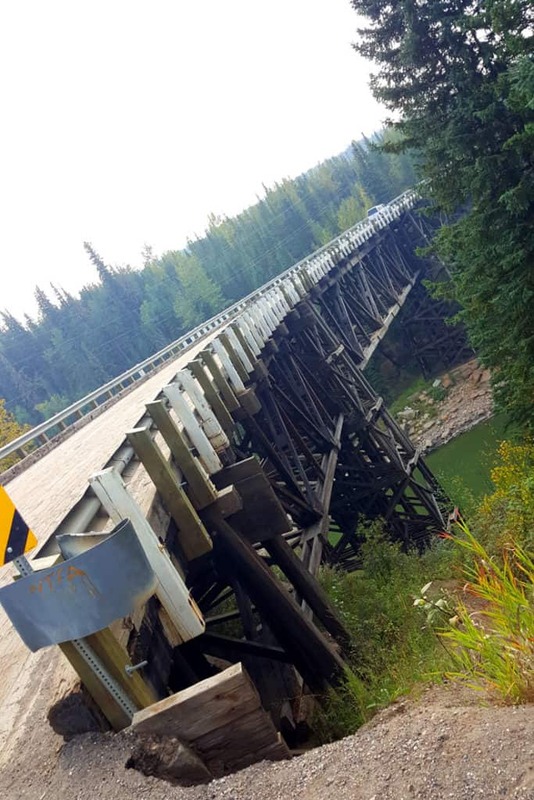 A famous local attraction is Kiskatinaw Bridge – formerly a part of the original Alaskan Highway, it’s now a historic site. 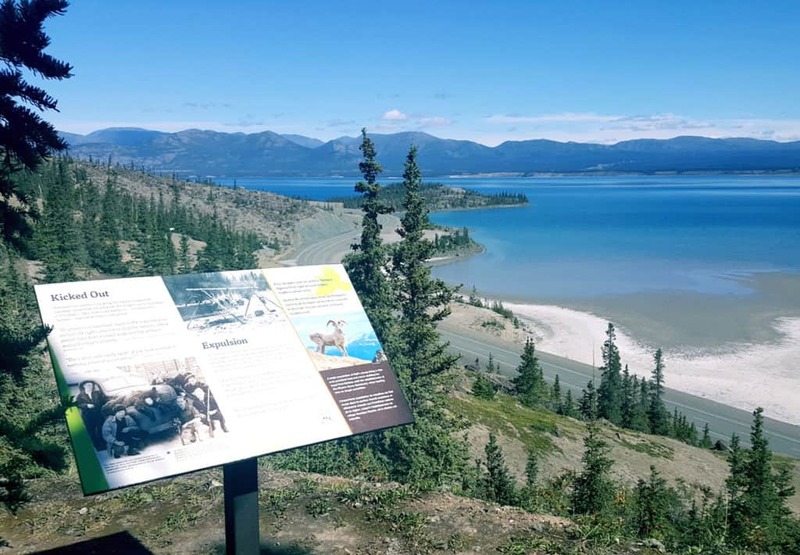 For even more local history, you can visit the Alaska Highway House – a small museum about the road’s construction – or the Walter Wright Pioneer Village – a small historic park recounting the early days of Dawson Creek. We didn’t stop in Dawson Creek for very long, so I don’t have a lot to report. We did drive through historic Kiskatinaw Bridge which made for a short detour. 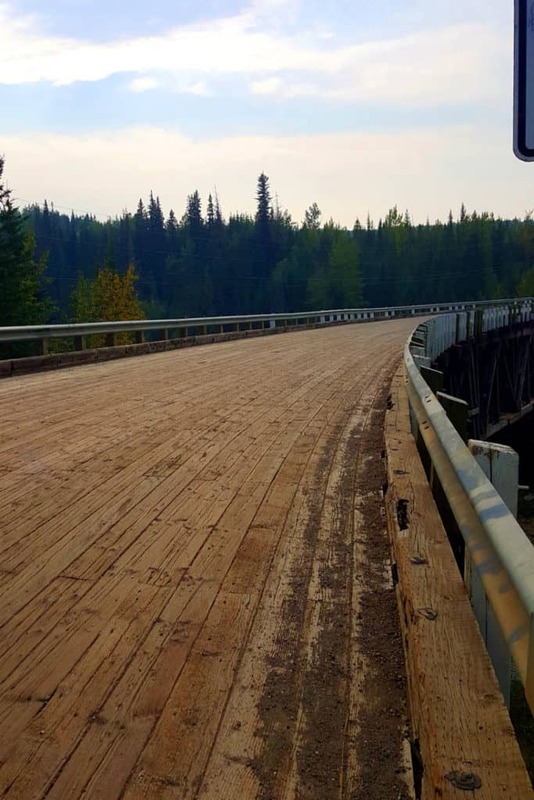 By the time we were there we knew so much about the Alaska Highway, it was actually quite exciting to see one of its original bridges. This small town of 4,000 people is a natural stop between Dawson Creek and Watson Lake. Other than stores and motels, you can find a great information center in town and The Fort Nelson Heritage Museum. Not surprisingly, this museum also focuses on the history of the Alaska Highway. 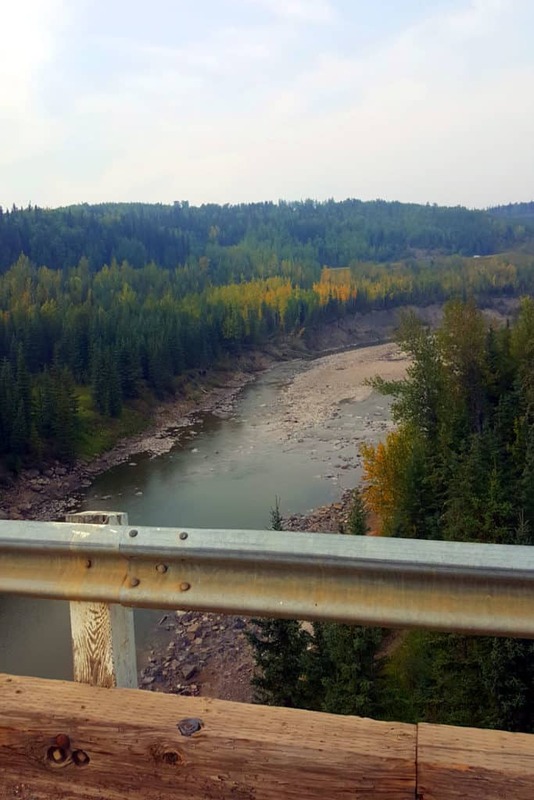 We did stop in Fort Nelson for a day. The visitors center was quite good. Spacious and well-designed it offered both free WiFi and help from the local staff. 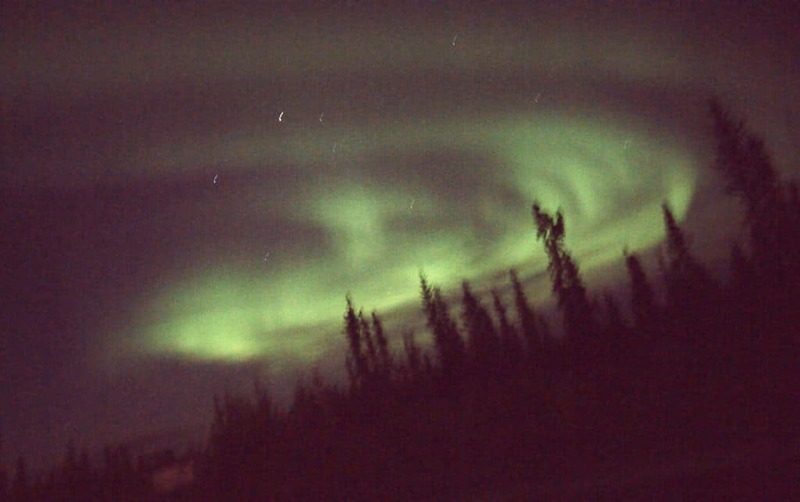 We decided to stop for the night to try and catch the Northern Lights because there was a good aurora forecast. Unfortunately, we didn’t get any light action that night. This photo was taken using my phone, so you can imagine just how impressive it was to see. One of the most memorable experiences of our entire trip. 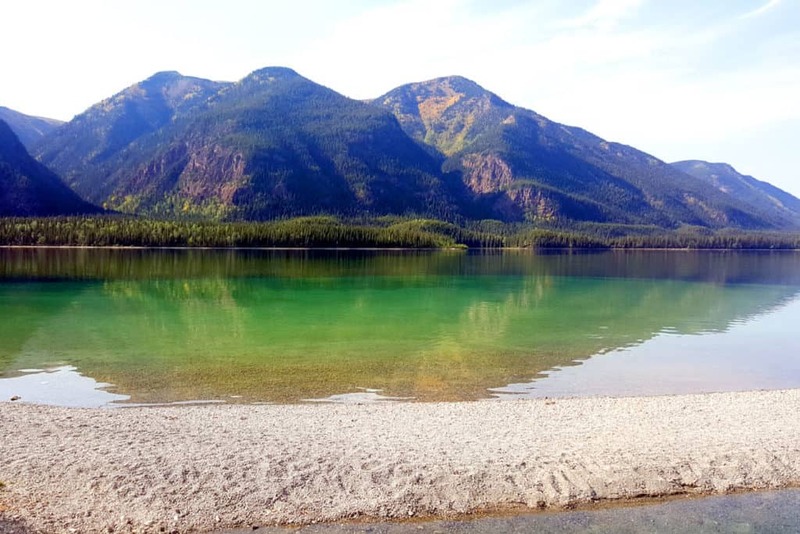 A beautiful jade-colored lake where you can stay at a local campground and hike the trails. The park and campgrounds close on September 8th. Steaming hot pools right in the middle of the Alaska Highway, how cool is that? No wonder it’s such a popular place. 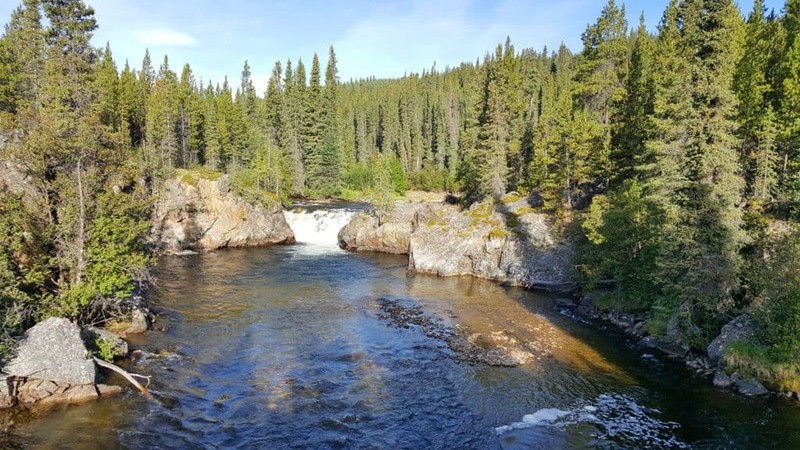 This is part of the Canadian Liard River Hot Springs Provincial Park and a must-do item on any traveler’s list. Nothing to report about Liard Springs, alas. We weren’t in the mood for a change of clothes and soaking in hot springs, sorry. Maybe next time! This small community is strategically placed near Mile 635 on the Alaska Highway. This means everyone stops here. 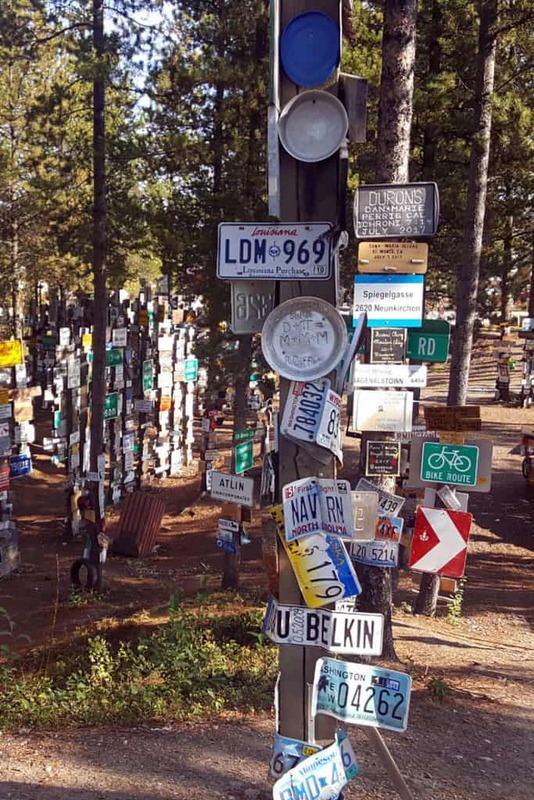 In fact, travelers from all over the world are the ones who created the town’s most famous attraction: The Sign Post Forest. 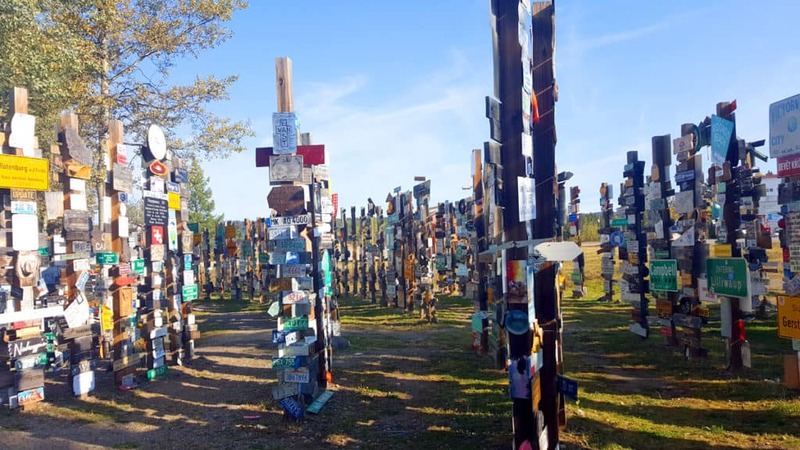 Just what it sounds like, it’s a small forest made of signposts from all over the world. If you visited Watson Lake in the 1980’s you probably only saw 30-40 thousand signs. Today it’s more than double that. Rancheria Falls makes for a really cute stop. 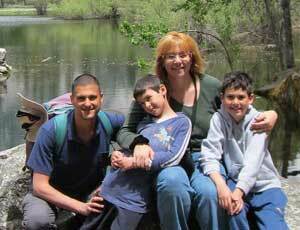 It’s a lovely short family hike with great views of the Rancheria River and the falls. There are also bathrooms – always good when you’re on a long road trip. To find them, just use Google maps and look for Rancheria Falls, Yukon. In advance, from home. There is no cell reception whatsoever in these areas, let alone data coverage. 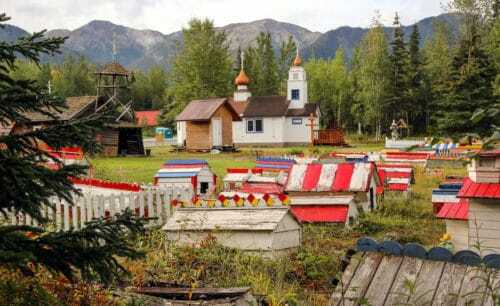 This small village of the Tlingit nation has less than 150 inhabitants but that’s enough to make it one of the largest First Nation settlements in the Yukon. 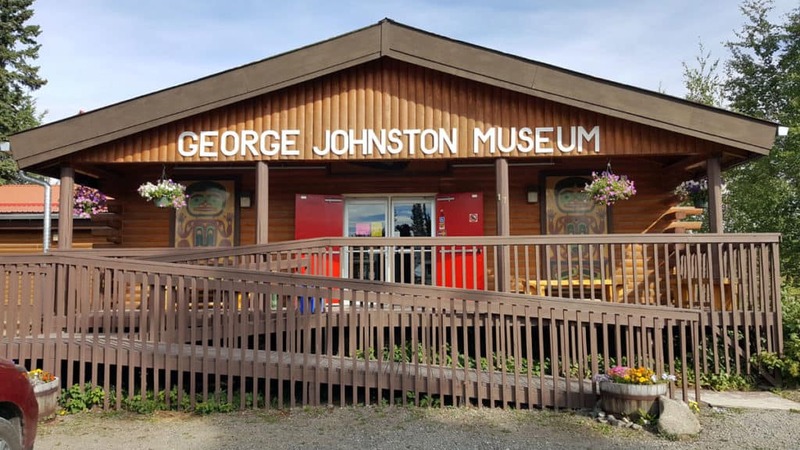 There are actually three small museums at Teslin which are recommended by travelers: The Teslin Tlingit Heritage Centre, the Northern Wildlife Museum and the George Johnston Museum. We ended up visiting the George Johnston Museum and it was really nice. We spend about an hour there and it was educational and fun. The museum tells the pretty amazing story of George Johnston, a local Tlingit Native who bought a car and brought it to Teslin in 1913. There were no roads in the Yukon back then but that did not stop Johnston from working as a very busy taxi driver in the area. He simply drove on the lake! You can see his car in the museum and also learn a lot about native Tlingit heritage. Miles Canyon – Trails that take you through a beautiful canyon and some historic sites. Read more. The SS Klondike – A former gold rush ship turned into a national historic park and museum. Read more. 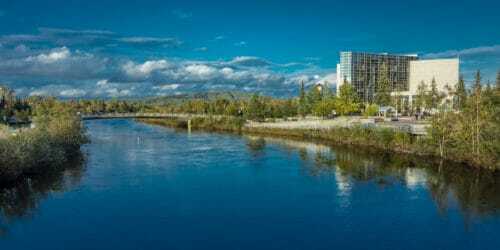 The Yukon Beringia Interpretive Center – A small museum that explores the ice age land bridge between North America and Asia. Read more. The MacBride Museum of Yukon History – Another small museum covering local history, including natural history. Read more. Kwanlin Dun Cultural Centre – A cultural center for the Kwanlin Dün First Nation people. Read more. 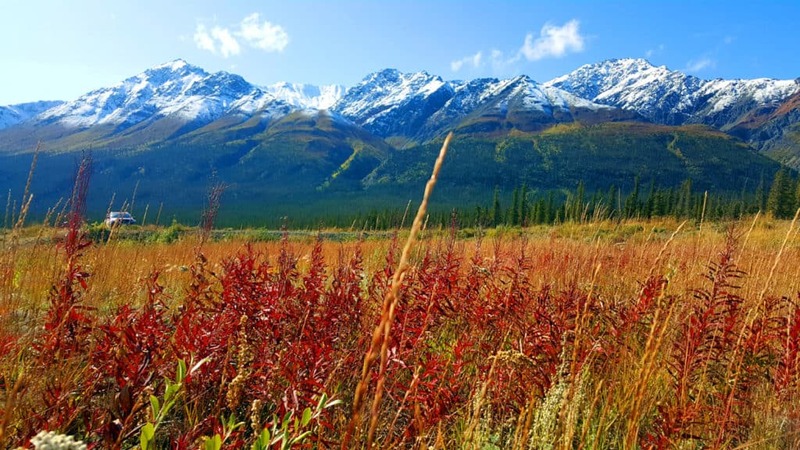 Yukon Wildlife Preserve – A conservation and research center where you can see many types of local wildlife. We spent 4 days in Whitehorse and it’s totally worth its own blog post (coming soon! Or as soon as I find the time – there’s so much to blog about yet!) 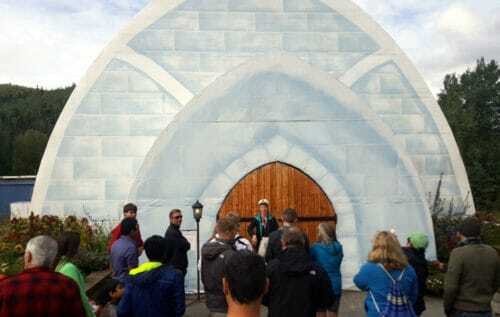 We visited the SS Klondike, The Beringia Interpretive Center, the Yukon Wildlife Preserve and Miles Canyon. It was also a great place to just stop for awhile and rest from the road. 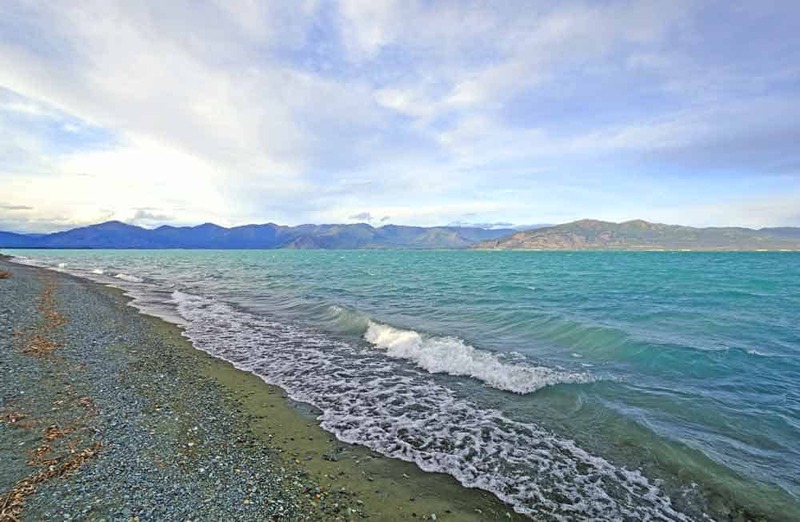 A small town of just over 500 people near the beautiful Kluane Lake and the Kluane National Park and Reserve. Ha, that was a short entry for a really big place! Kluane National Park is simply HUGE and very impressive. We drove the Alaska Highway through the park going both ways there was more to see than just Kluane Lake. They also had WiFi. It’s amazing to see how thirsty for WiFi you become while driving the Alaska Highway. Our kids treated Visitors Centers like oases in the middle of a desert! 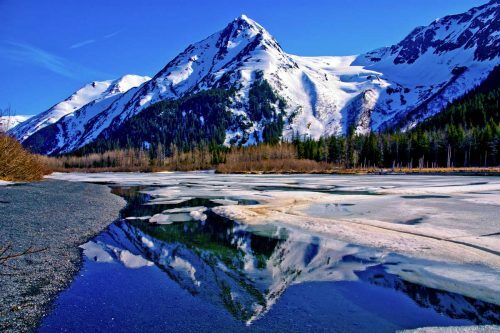 Kluane National Park covers the Canadian Side of the Wrangell St. Elias mountain range. 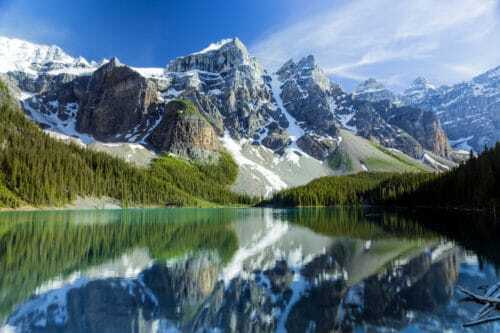 Which means it’s a huge and beautiful pristine wilderness. 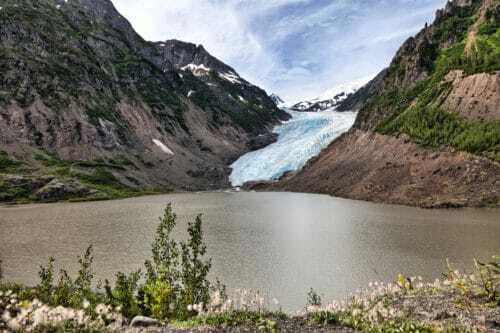 Just like Wrangell-St. Elias National Park on the American side of the border, it is also mostly inaccessible. 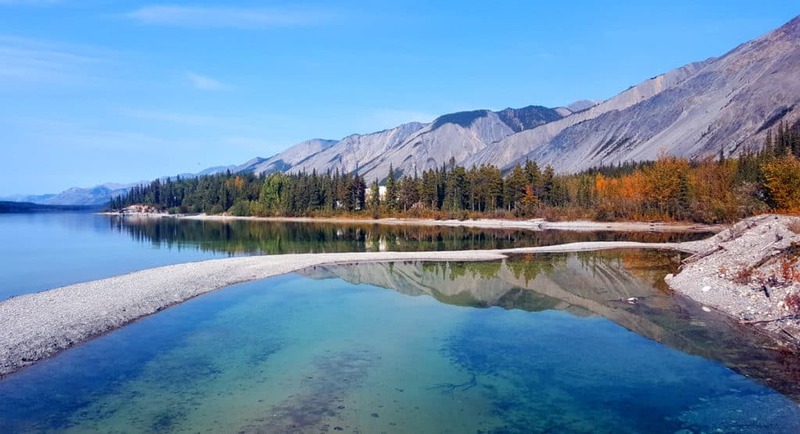 Unless you take an expensive flight over the park or take a long wilderness hike, your views of Kluane National Park will be limited to what you can see from the Alaska Highway as you drive through. Fortunately, that’s quite a lot of beautiful mountain views to take in! Bonus Point: The border crossing! With no border control personnel for miles in either direction, you can hop from one country to the other all you want! It’s a big heavy post too. We tried moving it to see if we could change the regional balance of power. Nothing happened and so a huge international crisis has been averted. Whew! Not much to do at Tok itself, but it’s where you can stop and consider if you’re going to continue up north towards Fairbanks, or take a left turn for Anchorage and the Kenai Peninsula. There are several motels and a good visitors center if you want to hang around for a day before you decide. Indeed, not much to do in Tok. We continued onward to Fairbanks and then drove back through Tok again. Wasn’t much to do there the second time around. There are several gas stations, a few restaurants and motels. That’s it. At last! 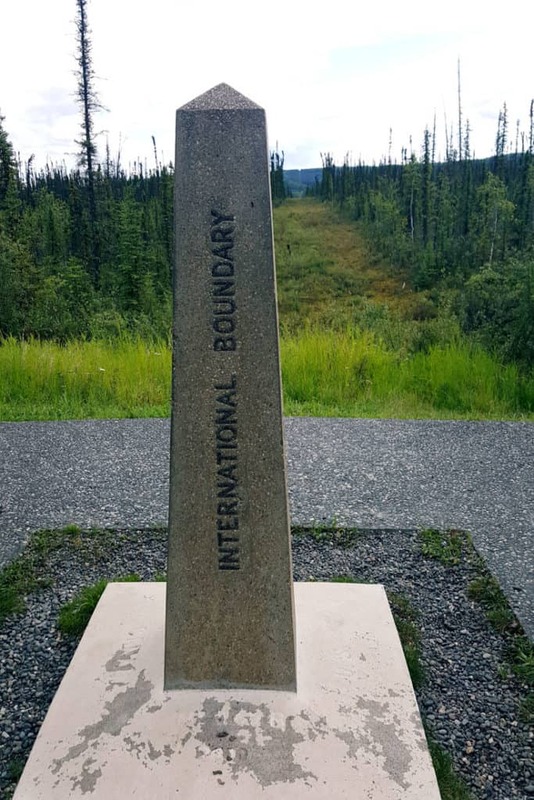 Your last stop on the Alaska Highway! About 1000 people live here and there’s actually a bit of local history to check out before you continue on your way up north to Fairbanks. You can stroll around the Big Delta State Historical Park for a taste of the early days of Alaska’s pioneers and visit the Sullivan Roadhouse Historical Museum, the oldest roadhouse in Alaska. It was raining when we were driving through this section, and we really wanted to get to Fairbanks, so we skipped a visit here. Saving it for our next drive along the Alaska Highway! Here’s an interactive map of the places originally mentioned in this post. You can zoom in and out, or click on the icon on the top left corner to see the names of the various destinations and get additional information. 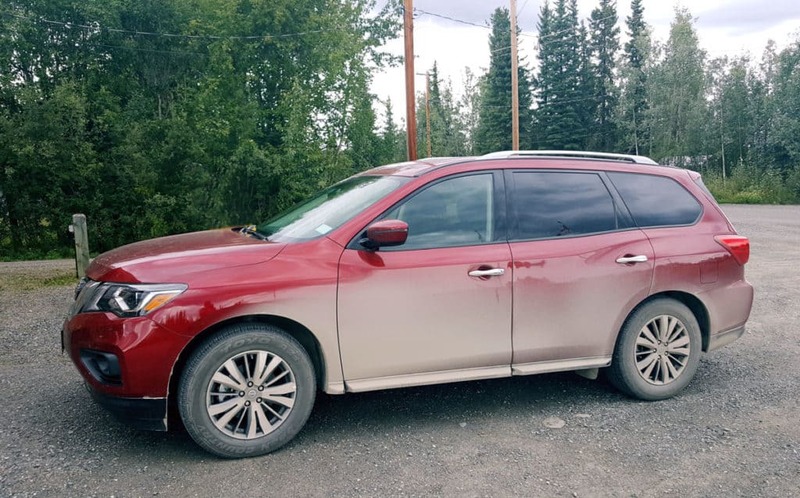 So, what was driving the Alaska Highway like? Not too bad though. No scratches or damage to the windshield. Except for that section of the road, the rest of the Alaska Highway was surprisingly easy to drive with excellent road quality. The further up north you go, the fewer people around you. Traffic was super easy outside towns (and just regular easy inside them). North of Fort Nelson, we couldn’t get any cell reception whatsoever even in towns, so keep that in mind too. And don’t rely on WiFi in roadside motels. They don’t have it in these areas, or if they do, you just may be able to check your mail, nothing more. The exception would be in Whitehorse and Watson Lake where we had semi-decent Wifi (as decent as that of an average motel, which isn’t much). Outside of these towns, WiFi is extremely rare. So, what do you think? 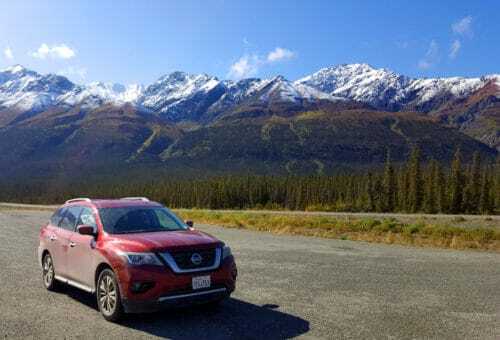 Have you ever driven along the Alaska Highway? 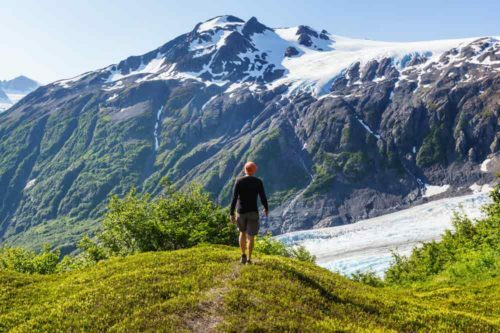 Or is it on your own private Bucket List for a future trip? Let me know in the comments! Would love to drive from Calgary to Fairbanks and then switch to the train, followed by the ferry. (Our plans are a moveable feast at the moment!) 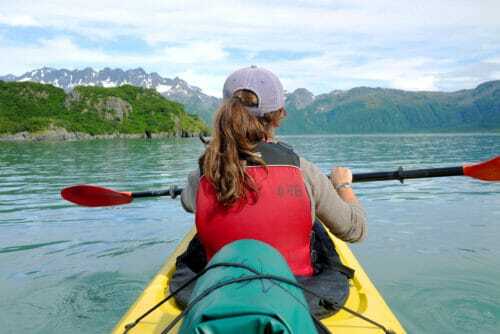 We’d love to go in June, as we’ve been to Alaska before and this suits us best. Can’t find a rental company willing to pick up near the border and drop at Fairbanks/Anchorage – any ideas??? Read all of your article and found it very useful. My wife and I along with 9 other couples are planning on travelling this route all the way to Denali and Anchorage and anything in between in June of 2019. We each have our own trailers or campers and are in the process of planning out our journey so we are reading up on what ever publications we can get to. We have 2 wagon masters who are working on the route and we are calling this our trip of a lifetime. We are not rushing and hope to make the most of our journey along the way. Thanks Again. This sounds absolutely fantastic! Our plan/fantasy is to buy an RV and keep it in the US for several years, coming to travel for half a year out of every year (we live in Israel). This will have to wait until we’re at least semi-retired, so probably 5-6 years from now. I can totally relate to learning a lot in advance. 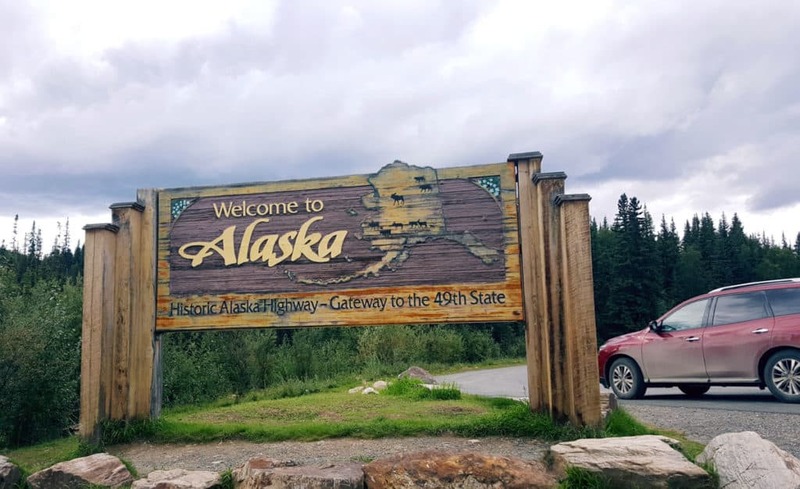 I had been planning our Alaska road trip for years before we actually did it. Now I’m researching RV’s, trucks etc. to be prepared when the time comes. I actually started a small blog about that, just keeping track of what I’m learning. If anyone’s interested it’s at http://www.VEHQ.com. Very early days though – just a few posts at this point – but I’d love to get comments from like-minded future RV travelers! how is the motel availabilty injuly and august? Great question, hunter! It bothered me before we went there. What I found was that it’s easier to find a reasonably-priced motel in August and September along the Alaska Highway than it is in Alaska itself. Alaska is super expensive so I would highly advise anyone going there to make reservations even 10-12 months ahead of time. 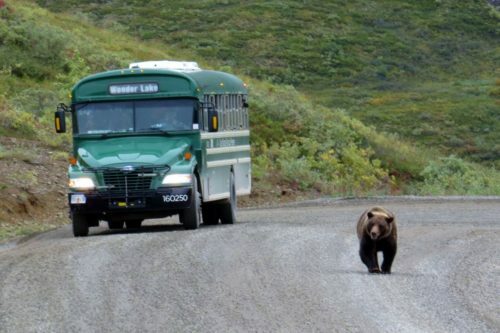 The Alaska Highway doesn’t work like that, apparently. Because it’s difficult to know how much driving you’ll end up doing, people book accommodation that far in advance. Many motels along the road don’t have internet so they don’t get online reservations. 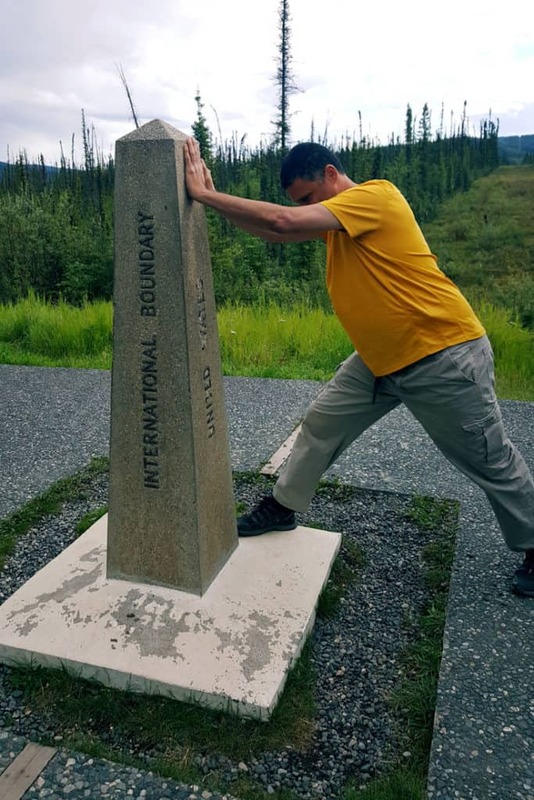 We stayed in Fort Nelson, Watson Lake, Whitehorse and a couple of places that were literally “along the road”. The only place we made reservations in advance was Whitehorse. Had no problem finding available motels in the other locations and prices were very reasonable (around $100-120CAD for a family of four). Myu name is John and I travel the AK Highway many times each year. 67 times so far! I just wanted to mention to any new travelers on the Alcan, it isn’t all about attractions or towns and museums. To those that rise early, it seems to be the best time to view wildlife. Although I have seen wildlife at all time of the day and night. I personally believe Apr. 15 – June 15 is the best travel time to see wildlife. Newborns of all species are out and about with mom and are a joy to see. The weather may be cooler in April, but I have had great driving in most late Apr. trips… snow can come at any time in the mountains, so stay informed of the weather. My best suggestion to anyone traveling the Alcan, is keep your eyes open, look back into the brush, behind trees and along rivers, and take time to view at the pulloffs and rest areas. Happy travels and be careful! ps: take time to talk to the locals, some have some great stories and many can point out places to see and visit. Thanks for stopping by and leaving a comment, John! I totally agree with your recommendation! 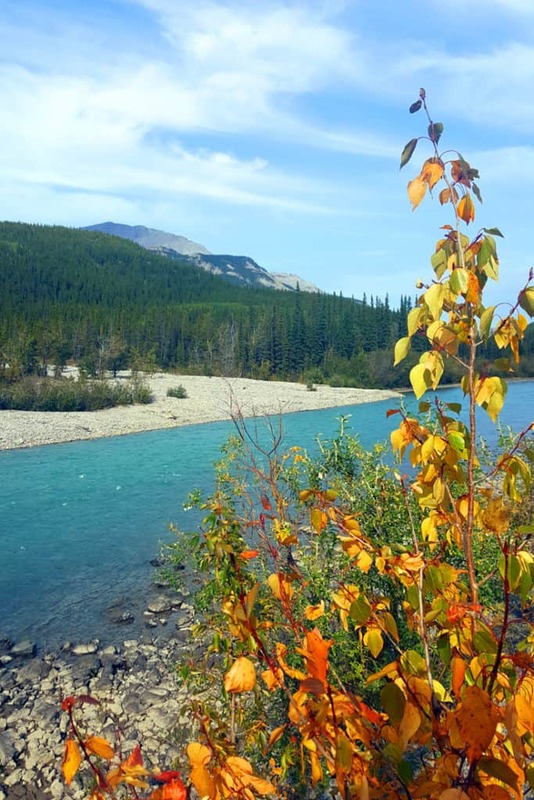 We returned from summer our road trip, traveling the Alcan (and the Cassiar too!) in August and September. We loved the wildlife and the sense of wilderness. We saw bears, moose and wood bison along the way and had a great time just being out there and absorbing. Will definitely be back for a spring drive someday! We are currently in Dawson Creek. 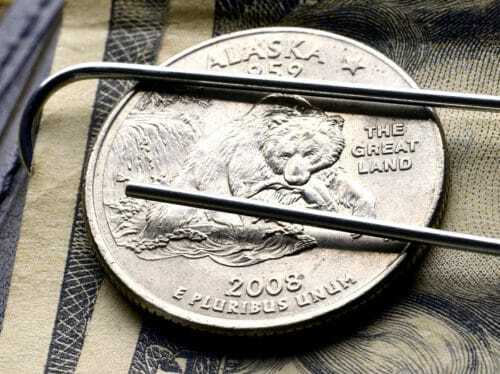 The your post is very helpful and we plan to stop at each of them either on the way up to Fairbanks on the way back. We also have The Milepost. That’s awesome, Tina! We’ll be starting our own LA to Alaska and back road trip in less than two weeks!